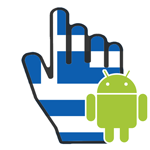 GreekBack is a Text-To-Speech app for Android with unique accessibility enhancements for the Greek language. It is specially designed to integrate seemesly with TalkBack screen reader and pronounce Greek everywhere: in SMS, e-mails, web pages, exploring the device etc. Includes pesto TTS Greek text-to-speech synthesizer, bundled with the small-footprint voice "Simos_1081". The only TTS that speaks Greek in all SMS. The only TTS that speaks the full form of abbreviated phrases in Android icons and options. Correct pronunciation of Greek texts in any environment. Tuned pronunciation of abbreviations, dates and telephone numbers to be well understood by the user. Provides 1-click shortcuts to accessibility settings. Seamless integration with Google's stock screen reader Talkback. Fast responsiveness to user gestures even in old devices. Extremely fast and efficiently light.